In 2006, the Boy Scouts of America created the Composite Materials merit badge for scouts to earn, to help them learn about the importance of composite materials and encourage them to consider careers in this field. 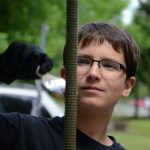 Being an aerospace composites engineer as well as an active scouting advisor, I saw this as a natural opportunity to share my interest and experience in composite materials with the scouts in my troop. 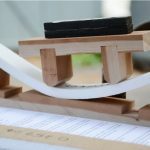 I developed a set of projects to help the scouts learn about composite materials and share them in the hope of getting more young men interested in this exciting field. 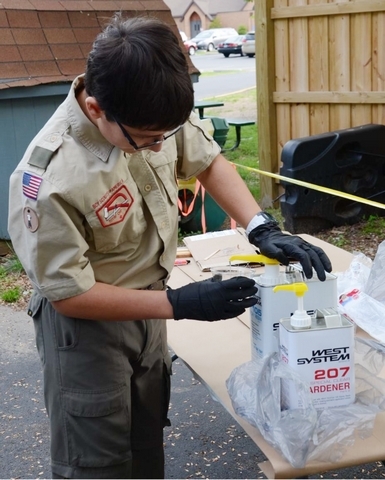 As part of the requirements for earning this merit badge, the scouts learn about the constituent fibers and matrices that make up composite materials including graphite, fiberglass, Kevlar®, epoxy, and polyester. 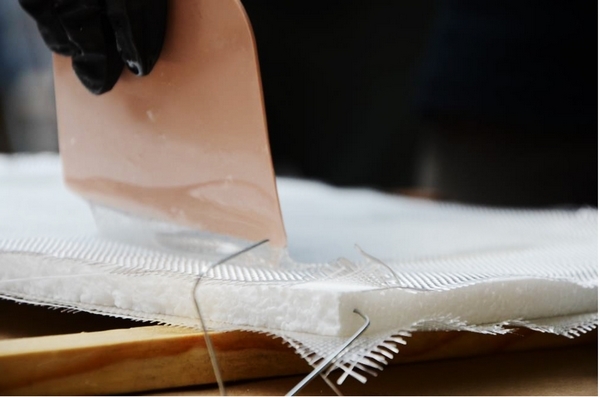 They also learn about processing and fabrication techniques such as hand lamination, filament winding, and oven—versus autoclave—curing. Most importantly, they learn how to use these materials safely. The most challenging (and fun!) requirement to earn this badge is making two separate items with composite materials under the merit badge counselor’s guidance and direction. 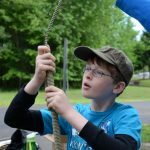 The inspiration for this project came directly from Robert Baden-Powell, the founder of The Boy Scouts Association, who consider the “Scout staff” to be an indispensable part of a Scout’s equipment. The basic staff should be about 5′ long, strong, stiff, and easy to hold and carry (therefore lightweight). It can be customized in a variety of ways to provide a scout with useful tools while adventuring in the outdoors. 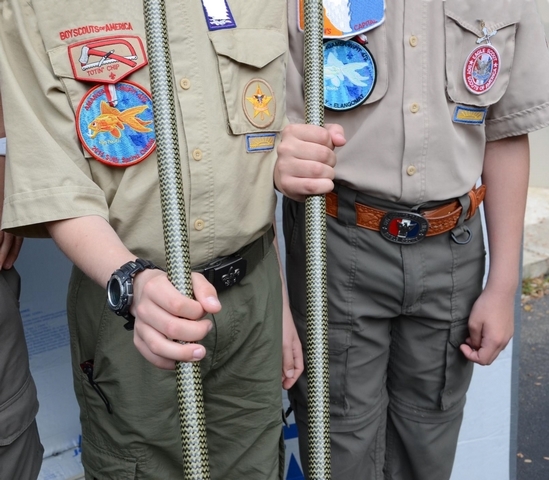 While Baden-Powell conceived this staff out of wood, I thought it would be helpful to upgrade the Scout staff with 21st-century materials, since many of the requirements for the staff are the same ones I use for optimizing aerospace structures. A&P Technology offers braided fibers in a variety of sizes and material choices. The ideal staff should be stout, but easy to wrap your hand around, so I chose a braid that was 1″ in diameter. While graphite would provide a classic composite material look, Kevlar was much more appealing to the scouts because of the idea that they would have a “bullet-proof” hiking staff. In the end, I chose a hybrid braid of graphite and Kevlar that provided decorative interest to the staff as well as stiffness and strength. Scout slides Kevlar/graphite braided sleeve over PVC pipe mandrel. Choosing an appropriate mandrel for the staff was a challenge. A removable mandrel for a 5′ staff would be difficult at best, so I quickly turned to core materials that would stay with the staff. 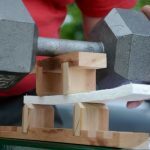 Previous groups had used foam core which would result in a very light and sturdy staff, but I could not find an off-the-shelf core, and a custom-made core would be cost-prohibitive. I also considered cardboard tubes, but again, 1″ diameter by 5′ long tubes were not available and too costly to custom-make. Ultimately I chose 1″ PVC pipe as the mandrel. While not as light as the other options, it was readily available, low-cost, and easy for the scouts to use. I did not have access to an autoclave, so the choices for resin materials were limited, compared to what I typically use to create aerospace parts. WEST SYSTEM Epoxy offered ease of use, room-temperature curing, and a strong durable finish. Experts at the WEST SYSTEM technical support center recommended their 105 Resin with 207 Hardener for this application so that the finished product would have a clear surface that would not yellow over time. They also recommended at least three coats of epoxy to provide a smooth surface. 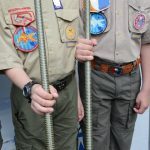 The scouts measured out the epoxy and hardener in plastic cups, and they used brushes to apply the epoxy while the staves were hung vertically. This prevented the epoxy from pooling on one side of the staff. Scout measures out and mixes epoxy resin and hardener. Braid donated by A&P Technology. 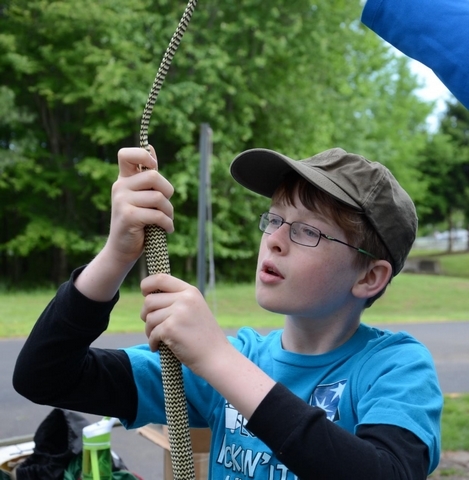 Hiking staves were hung vertically while scouts used brushes to coat the fibers. Hanging the staves prevented epoxy from pooling on one side of the staff. The only disadvantage of using this resin-hardener system is that it is slower to cure. 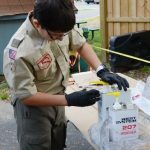 Since I offered this Composite Materials merit badge to scouts as part of a one-day Merit Badge University that our troop runs for the local scouting District, the project had to be completed within a single 8-hour period. To accelerate the cure reaction, I created a simple oven from ½” insulation board and duct tape, and heated it by four 100-watt halogen lights. The oven was efficient enough to reach about 120°F, which reduced the typical 8-hour cure time to 2 hours. This enabled a well-paced day, allowing the scouts to complete three cure cycles on the hiking staff while giving us time to discuss fibers, resins, processing methods and applications while the staves were curing. The finished hiking staves were strong, light-weight and ready to hit the trail. The cure reaction was accelerated by heating in an oven (home-built using insulation board and halogen lights) to allow the scouts to apply three coats of epoxy within the 8 hour day. 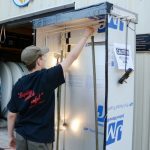 As a second project, the scouts created sandwich panels from fiberglass cloth and the same epoxy over a ¼” Styrofoam board. In this case, they used plastic spreaders to distribute the epoxy into the cloth. This project required only one cure cycle to create a good structural bond between the fiberglass and the foam core. 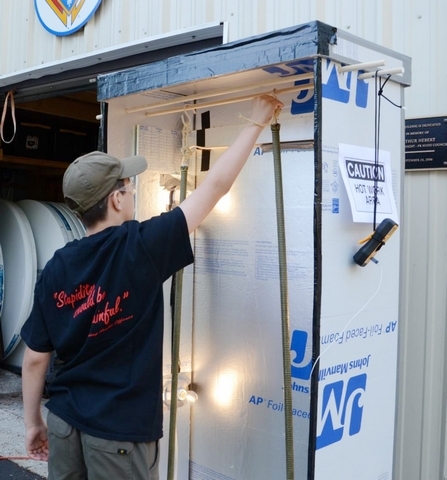 The scouts made sandwich panels from fiberglass cloth and Styrofoam. When the panels were cured, we tested them in a simple four-point bend apparatus. 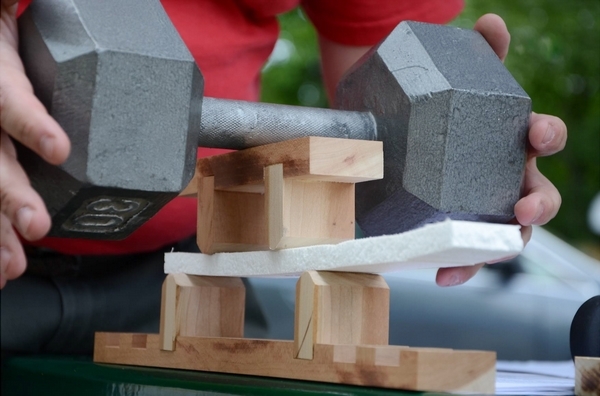 The foam core alone weighed 0.08 oz and held 12 oz before breaking while the fiberglass panel of the same size weighed 0.8 oz and supported over 30 pounds. 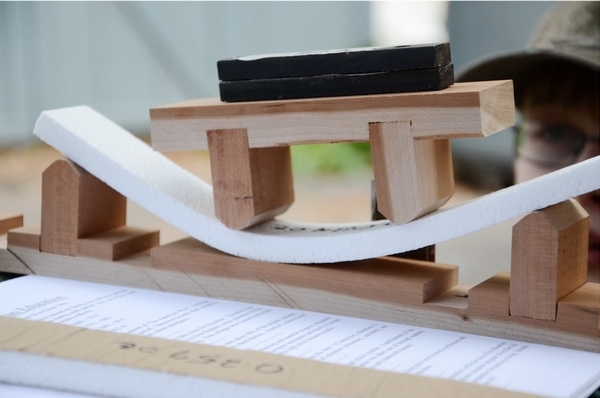 This demonstration made a lasting impression on the scouts as to the strength and structural efficiency of composite material construction. The foam alone only supported 12 ounces. The composite panel supported over 30 pounds. The finished product: fully cured hiking staves ready to hit the trail. Dr. Tom Dragone is a Senior Scientist at Orbital Sciences Corporation, specializing in the application of composite materials in advanced spacecraft and launch vehicle structures. 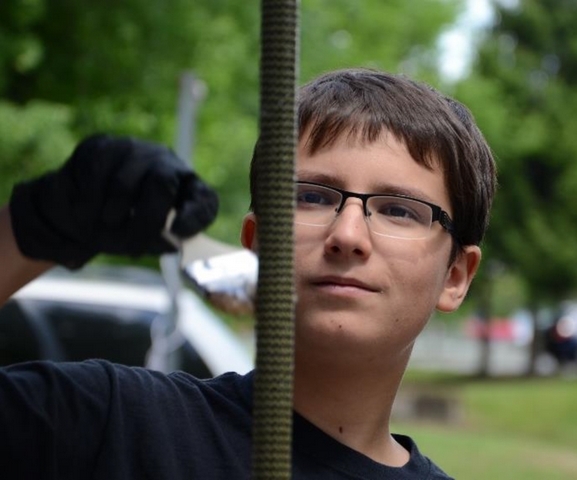 He is also Advancement Chair for Troop 7369 in Chantilly, Virginia.